Are you looking for the FIRST EDITION of this book? 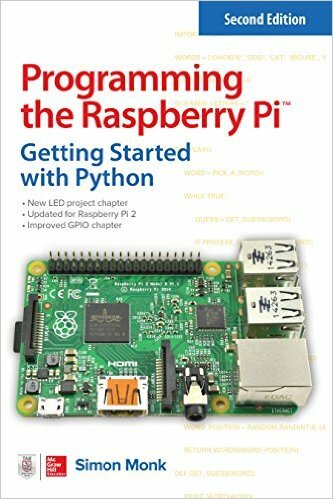 This is the second edition of my book ‘Programming the Raspberry Pi’. It has been fully updated for the new Raspberry Pi models and has much improved and expanded sections on using the GPIO pins. Page 80 and 81. When pickling on Python 3, the files must be opened with the options ‘wb’ and ‘rb’ and not just ‘w’ and ‘r’ as shown in the code listings. Thanks to Takashi Yamanoue for finding this. Page 127. ser=serial.Serial(‘dev/ttyACMO’,9600′), this does not work. Need to use: serial=serial.Serial(‘dev/ttyUSB0’, 9600). Thanks Bob.